Yates has had summer camp “in his blood” for many years. He and his brothers attended Falling Creek Camp for twelve summers as a camper, C.I.T., and staff member. After graduating Appalachian State University with a degree in recreation, Yates returned to his hometown of Charlotte, N.C., to serve as President of Bissell Development. In 1991, he and his wife Marisa married and now have five daughters: Annie, Lucy, Mary, Danielle, & Jasmine. Even as Yates was forging a successful career in the business world, he continued to work with children, serving as assistant scoutmaster for the same troop in which he earned his Eagle Scout. 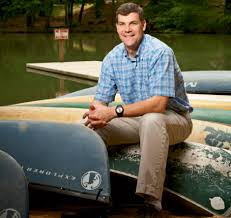 Yates and his family moved to Asheville and Yates became Vice President of commercial development for Biltmore Farms until returning to camp in September, 2005. It was and continues to be the opportunity of a lifetime for them.